Carpet beetles feed on animal and plant substances such as wool, fur, feathers, hair, hides, horns, silk, velvet, felts, and bone as well as seeds, grain, cereals, cake mixes, red pepper, rye meal, and flour. Other substances include powdered milk, dog and cat food, leather, book bindings, dead insects, bird and rodent nests, and even cotton, linen, rayon, and jute, especially when stained with spilled food and animal excreta. The larvae cause the damage, crawling from room to room and living behind baseboards and molding, and in heating system air ducts, dresser drawers, carpets, clothing, and furniture. Feeding damage often occurs under heavy furniture or pianos and at carpet edges. Adult beetles fly readily in May and June. They are attracted to night-lights, and may enter through an open window or door. Some may be brought in accidentally on cut flowers or in furniture that has been in storage or sent out for repair. 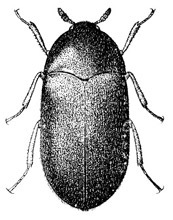 Adult black carpet beetles are oval and shiny-black with brownish legs. They vary in body length from 1⁄8 to 3⁄16 inch. Larvae, frequently staying hidden when feeding, are golden to dark brown and about 1/2-inch long. The body resembles an elongated carrot or cigar with a long brush of bristles at the tail end. Adult varied carpet beetles are about 1⁄10- to 1/8-inch long and nearly round. The top body surface is usually gray with a mixture of white, brown, and yellow scales and irregular black crossbands. The bottom surface has long, gray-yellow scales. (These scales are 2½ to 4 times as long they are broad.) Larvae are about 1/4 inch and light to dark brown. The body is wide and broader at the rear than the front. Adult common carpet beetles are about 1⁄10- to 1/8-inch long, nearly round, and gray to black. They have minute, whitish scales and a band of orange-red scales down the middle of the back and around the eyes. Larvae, frequently moving rapidly, are elongated, oval, reddish-brown, about 1/4-inch long and are covered with many brownish-black hairs. Adult furniture carpet beetles are about 1⁄16- to 1/8-inch long, nearly round and whitish checkered with black spots, each outlined with yellowish orange scales. These scales are broadly oval and two times or less long as broad. The legs have yellow scales. The bottom surface of the body is white. Color patterns vary. Larvae, frequently crawling rapidly, are about 1/4 inch, elongated, oval, and covered thickly with brownish hair. A good quality hand lens or microscope is necessary to see these characters. All carpet beetles pass through the egg, larva, pupa, and adult stages. Adults fly readily and during warm, sunny days feed outdoors on flower pollen of spirea, dogwood, crepe myrtle, and buckwheat that have white or cream-colored flowers. Others feed on daisies, wild asters, etc. Adults are attracted by light, fly into homes, and may be found on windows and screens. Depending on the species, each female can lay up to 100 white eggs or more that hatch in 8 to 15 days in warm weather. Eggs laid indoors occur in lint accumulations near the food source, in air ducts, under heavy furniture, underneath baseboards, etc. 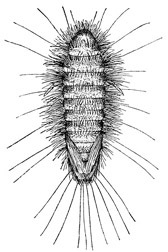 After hatching, larvae begin their destructive feeding, avoiding light, and molting several times as they develop. Sixty days to a year or more may be spent in the larval stage feeding, depending on food and temperature. 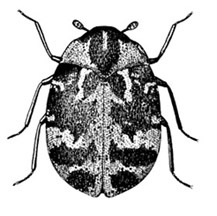 Some life cycles are two to three years, depending on the species of carpet beetle. When rooms are warm indoors, the life cycle is shorter than in an unheated portion of the house during the winter. In the spring, the pupa stage is followed by new adults. 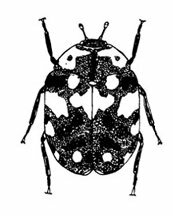 Usually there are three to four generations per year except for the black or varied carpet beetle that may have one generation per year. Locate the source of infestation before treatment. Carpet beetle larvae prefer to feed in dark, undisturbed, protected places. Use a flashlight and nail file to check in such places as under baseboards, in and under upholstered furniture, piano felts, air ducts, stuffed animal trophies, stored cereals, bird nests under eaves, rodent nests, wasp nests in attics, dead birds or rodents in wall voids, woolens, clothes closets, furs, etc. Often the cast skins are more abundant than the larvae. 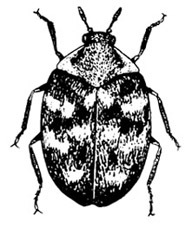 Adult beetles flying around windows may help in locating the infestation. Good housekeeping is critical. Use a strong suction vacuum cleaner with proper attachments to remove lint, hair, and dust from floors, shelves, and drawers. Periodically brush, air outside, or dry-clean furs, woolens, blankets, etc. Clean rugs, carpets, draperies, furniture, baseboards, air vents, moldings, and other hard-to-reach places regularly. Destroy untreated worthless animal skins or hides, valueless insect collections, old woolen rags, and old clothing. Cedar-lined closets and chests help but are not 100 percent effective. Use one pound of naphthalene flakes or balls or paradichlorobenzene (PDB) crystals per 100 cubic feet of closet space for limited protection. Any tight box or bag that can be sealed is a good storage container. Place garments in and add PDB crystals or naphthalene flakes interspaced between sheets of paper. Use one ounce of crystals or flakes per two cubic feet of container space. Be sure that all cloth goods are dry-cleaned, washed, pressed with a hot iron, sunned, or brushed prior to storage. Fur storage in cold vaults is effective. Remove and destroy abandoned bird and insect nests in attics, under eaves, etc. Woolen carpets, clothing, and blankets should be cleaned and immediately stored in tightly sealed containers. There used to be many insecticides labeled for carpet beetle control that were available for homeowner use, but most of these have been removed from the market due to toxic residues. If sanitation, prevention, and PDB treatments do not control infestations, seek the assistance of a pest control professional who has access to pesticides that are effective in eliminating and preventing carpet beetle infestations. In severe cases, this may also include fumigation techniques. 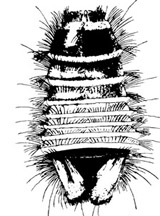 Total-release aerosols (often called bug bombs) are generally not effective at reaching the tiny cracks and crevices where the beetle larvae may reside. Before using insecticides, always READ THE LABEL and follow directions and safety precautions. This publication may contain pesticide recommendations that are subject to change at any time. These recommendations are provided only as a guide. It is always the pesticide applicator's responsibility, by law, to read and follow all current label directions for the specific pesticide being used. Due to constantly changing labels and product registration, some of the recommendations given in this writing may no longer be legal by the time you read them. If any information in these recommendations disagrees with the label, the recommendation must be disregarded. No endorsement is intended for products mentioned, nor is criticism meant for products not mentioned. The author, The Ohio State University, and Ohio State University Extension assume no liability resulting from the use of these recommendations.